In the study of our gardens, we have recently begun to look for and see shared characteristics between certain plants. At the most basic level, there are obvious common traits between different plants of the same genus or among a variety of cultivars of one species. However, a more educated eye has allowed us to move beyond the lower ranks in the biological classification system, such that we have begun to group plants across genera boundaries — by their biological Family. One particular plant family has captivated us – the Ericaceae Family. Ericaceae derives its name from one genus within the family — the Erica genus. Plants within the Erica genus are commonly known as Heaths, and thus the Ericaceae Family is commonly known as the Heath Family. According to the Missouri Botanic Garden’s Tropicos database of taxonomic information, Ericaceae was first recognized in 1789 in Genera Planatarum by Antoine de Laurent Jussieu. The Ericaceae Family consists of dicots within the Equisetopsida Class and Ericales Order in terms of overall biological classification. According to The Jepson Manual (a leading treatise for understanding key characteristics of California plants), the Ericaceae Family consists of approximately 100 genera, and 3000 species, including (in part): Arctostaphylos (manzanita), Arbutus (madrone), Comarostaphylis (summer holly), Empetrum (crowberry), Pyrolla (wintergreen), Vaccinium (blueberry and cranberry) and Rhododendron (azalea). Flora of North America attributes 120+ genera and more than 4000 species to the Ericaceae Family, and the description of the Ericaceae Family in FNA is found here: http://www.efloras.org/florataxon.aspx?flora_id=1&taxon_id=10316. The USDA Plant Database for the Ericaceae Family contains links to images of numerous plants within the Ericaceae Family and can be accessed here: http://plants.usda.gov/java/ClassificationServlet?source=display&classid=Ericaceae. The Ericaceae Family consists primarily of shrubs and small trees. They are mostly evergreen, though some deciduous (Rhododendron). They are distributed worldwide, but are highly compatible with our climate. 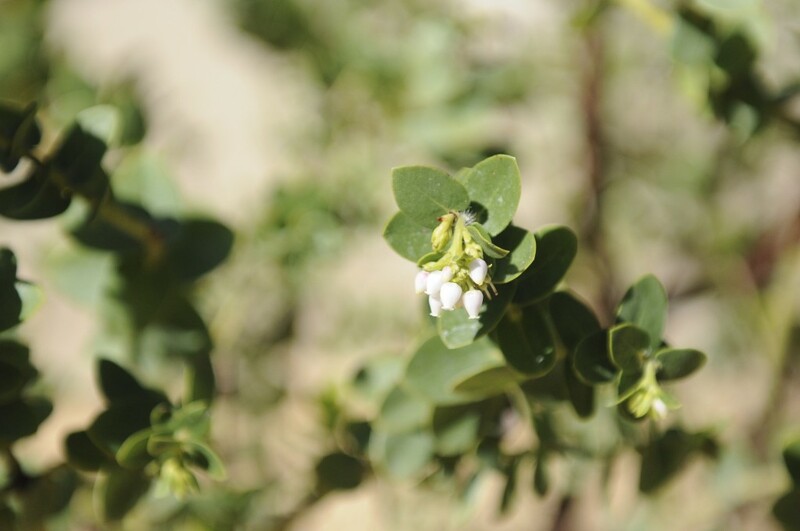 They are widely considered acid-loving (think Azalea), but certain genera (e.g., Arctostaphylos) will tolerate alkaline soils, and particularly the serpentine soils of the foothills in which we live. A dichotomous key for California plants within the Ericaceae Family can be found on The Jepson Manual’s online database: http://ucjeps.berkeley.edu/cgi-bin/get_key.pl? ERICACEAE. A more comprehensive, and interactive online (!) key for the Family has been prepared by USDA and is posted at: http://plants.usda.gov/plantkeys/ericaceae/ERICACEAE.html (very very useful). Plants of the Ericaceae Family within our gardens include 10+ varieties of Arctostaphylos (manzanita), Arbutus unedo compacta (madrone; strawberry tee) and Rhododendron (azalea). 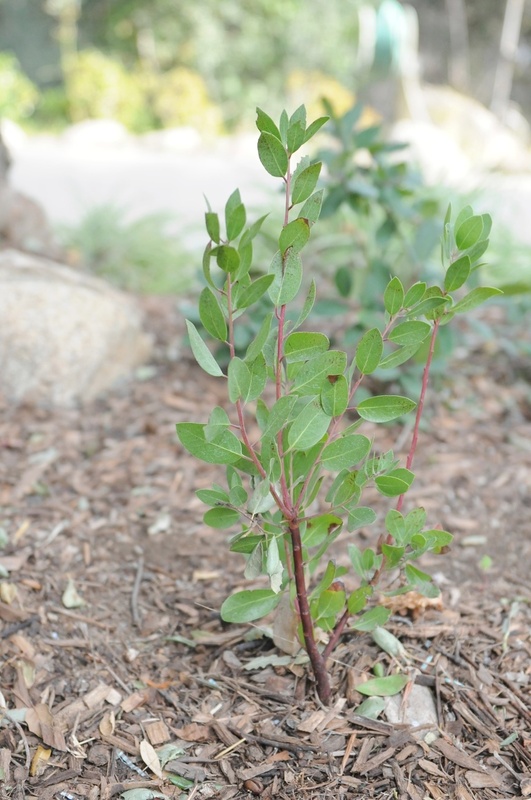 We intend to plant Vaccinium corymbosum (southern highbush blueberry) this year. Inflorescence: Terminal clusters, somewhat observable racemose (unbranched flowering cluster), umbellate (pedicels of the flowers begin in a common point like parts of an umbrella). Flowers: Actinomorphic (mirror image in any plane if bi-sected); Urn-like (this is the most distinctive trait to our untrained eye), white to pink; flowers appear in November and continued to bloom through March and early April. Here are a few photos illustrating certain of these key features (descriptions below the photos). Arctostaphylos x ‘Mama Bear’ illustrating the reddish brown nature of the bark, and simple, alternativing leaves. 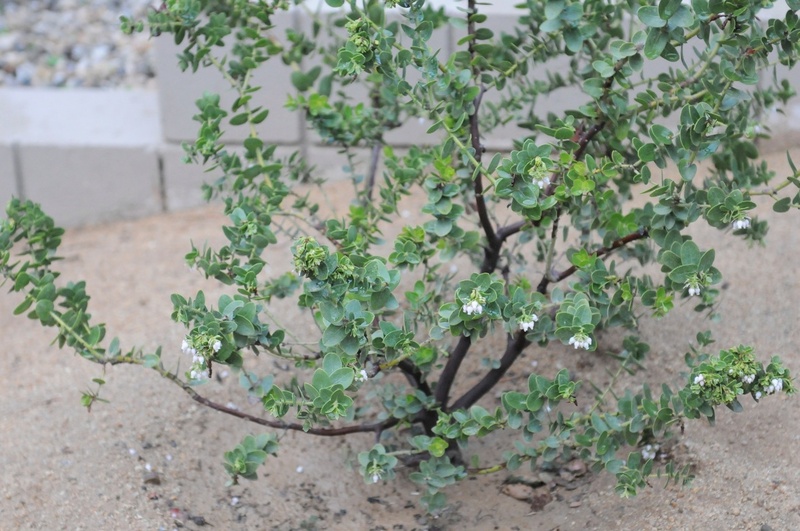 Arctostaphylos viridissima. Top down view showing distinctive architecture, terminal inflorescence, reddish brown bark, short to nil petioles, and glacous leaves. 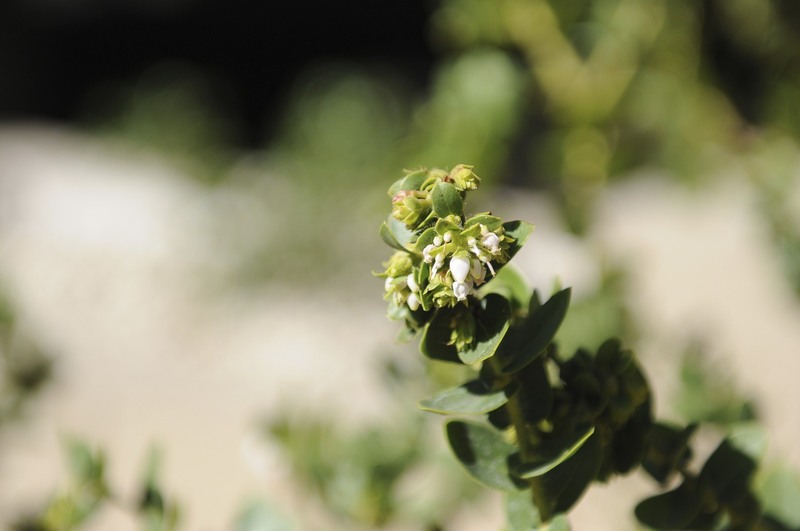 Arctostaphylos viridissima (white haired manzanita) beginning to flower in October 2011. Here one notes the urn-like shape of the flower and the terminal nature of the inflorescence. Arctostaphylos viridissima (white haired manzanita) flowering in December 2011. The umbellate nature of the inflorescence is somewhat apparent here. Note also the pubescence (hairy-ness) and distinctive bracts at the base of the pedicles. 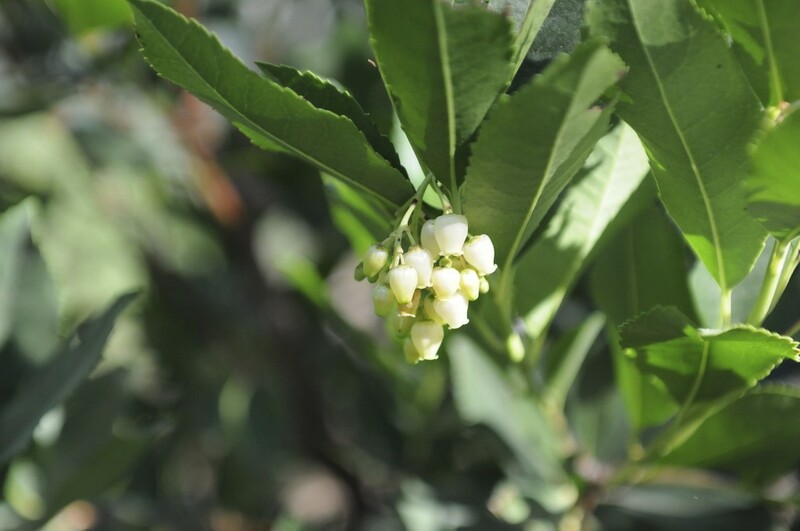 Arbutus unedo compacta (strawberry tree) illustrating shared characteristic of urn-like flowers. Petioles with small bracts are prominent here. The Jepson Manual, Vascular Plants of California, 2nd Edition, edited by Bruce G. Baldwin et al. A very nice piece of knowledge transfer… Well done! You are cementing your on-line identity as an expert gardener. Stay well friend. as blogs get updated all the time and the Adsense possibilities are almost limitless.